Hike the Ocmulgee National Monument in Macon, GA, exploring the park’s ancient Native American mounds and a wildlife-filled wetland. A trail network explores giant Native American mounds that rise from the banks of the Ocmulgee River near Macon, Georgia. 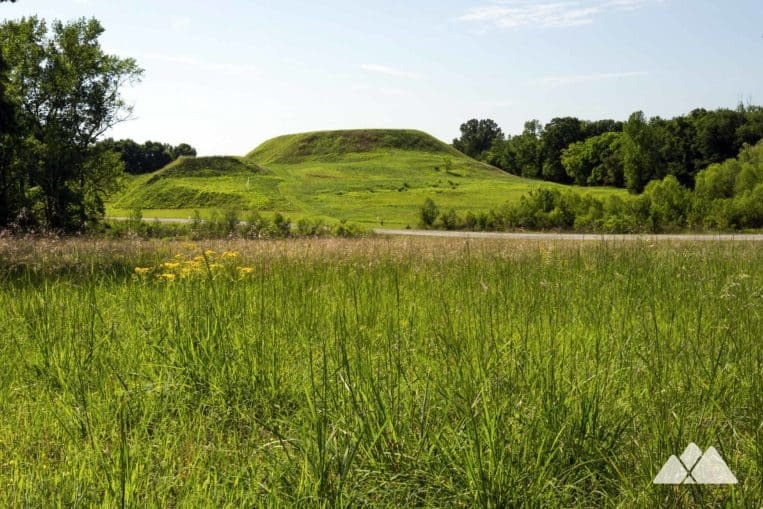 The Indian mounds at the Ocmulgee National Monument are a remnant of the ancient, yet advanced, communities that thrived here for thousands of years. Originally inhabited by ancient Paleo-Indians, the land was later home to the mound-building Mississippian Culture. The park is an important historical and archeological site: Native Americans have inhabited these lands for 17,000 years. Today, this 700-acre park, managed by the National Park Service, offers an excellent, educational outdoor adventure near modern-day Macon. The park’s network of trails explores many ancient, grassy Indian mounds, a wildlife-filled wetland on the banks of the Ocmulgee River, and a fern-filled forest. Near the park’s museum and visitor center, one trail ducks into the Earth Lodge, a domed ceremonial mound with a floor that’s over 1,000 years old. 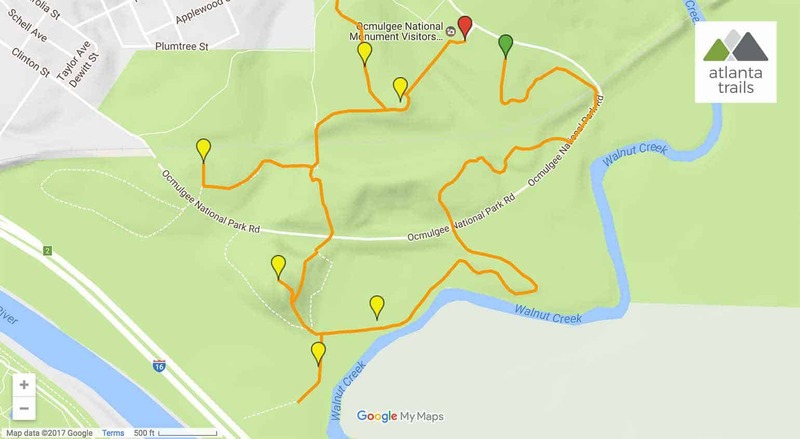 This 3.25-mile loop explores the highlights of the Ocmulgee National Monument park. The hike follows a southern segment of the Bartram Trail in Georgia, meandering through a marshy habitat frequented by wildlife. 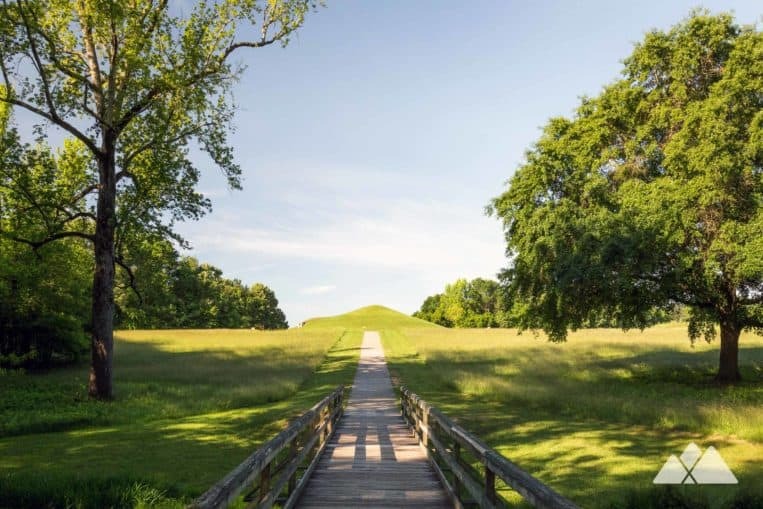 Then the hike loops into the park’s historic areas, climbing to great views from the top of the Great Temple Mound, visiting the grassy Funeral Mound, and exploring deep trenches at the Cornfield Mound. And then, for a finale, the hike enters the park’s earthen-domed Earth Lodge to view the ceremonial mound’s interior. It’s a fantastic hike filled with natural beauty, a huge dose of Georgia history, and great opportunities to spot wildlife. This loop hike begins at the trailhead at the southeast corner of the park’s visitor center parking area (view maps and driving directions). The hike descends, meandering through a beautiful, fern-filled, sunlight-dappled forest. The route follows the Bartram Trail, named after William Bartram, a writer and naturalist who explored the Southeast in the late 1700s and visited the park’s mounds on his journey. The Bartram Trail exits the forest canopy at .25 miles, following the park’s road under a historic brick train overpass. The trail follows the road for a short distance before diving back into the forest, looping to visit the Southeast Mound, one of the smallest in the park. The hike crosses the park’s paved road and then veers left on the Loop Trail, exploring the grassy banks of Walnut Creek, an Ocmulgee River tributary. The hike exits the Loop Trail, crossing two bridges and beginning the Opelofa Trail. Bordered by a wetland on both sides of the trail, the hike crosses an arched bridge, exploring the beautiful, grassy marsh. The Great Temple Mound towers in the near distance, reflecting in the glassy, still waters of the wetlands. Wildlife frequents the marsh habitat; pause here quietly for a chance to view otter, egret, dragonfly, deer, turtles, beavers and the occasional alligator in the water-filled wetlands. At 1.3 miles, the trail reaches the park’s River Trail, turning south to follow the River Trail’s extended boardwalk for an up-close view of the wetlands and Walnut Creek. Reaching the end of the boardwalk, this hike doubles back on the River Trail, and veers left at the boardwalk’s end. The trail climbs the Great Temple Mound via a series of wood stairs and platforms, rising high above the surrounding river plain. 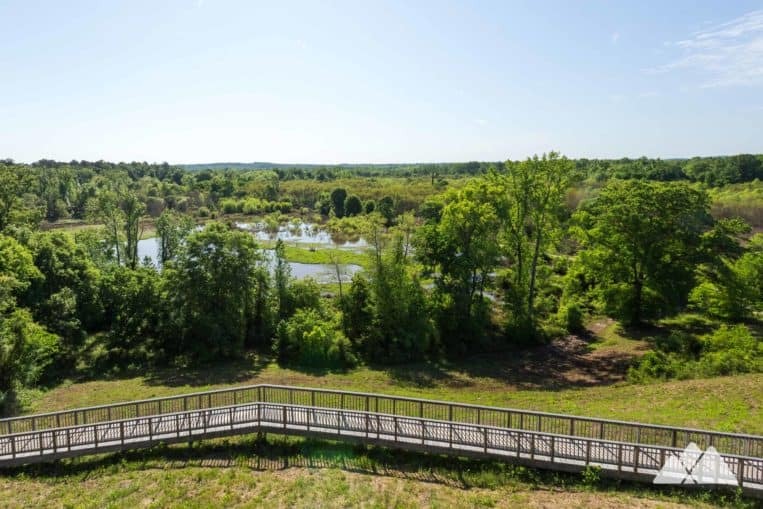 The mound’s flat-topped summit is spacious, level and grassy, offering stunning panoramic views of downtown Macon, the Walnut Creek wetlands, and the surrounding grassy mounds. The hike descends the Great Temple Mound, following a boardwalk and paved trail northbound, and crossing a park road before reaching the former site of a historic trading post. The hike veers left at the trading post location, crossing a bridge to explore the wildflower-covered Funeral Mound. 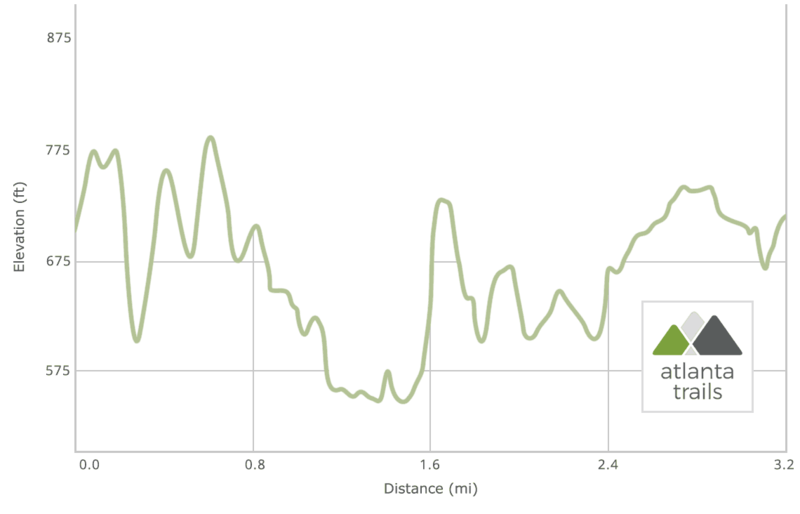 The route doubles back from the Funeral Mound and reaching the trading post site at 1.75 miles. The hike veers left to cross a bridge over train tracks before following a paved trail through a grassy meadow. Nearby, archaeologists found the oldest artifact at Ocmulgee National Monument: a projectile point in a fire pit that was carbon dated to 8,000 B.C.E. Nearing the hike’s end, the trail explores the park’s Cornfield Mound and prehistoric trenches before doubling back to the Earth Lodge. A side trail dives between the stout posts of the earth lodge entrance to catch a view inside the dimly-lit ceremonial lodge. Ducking back out of the Earth Lodge, the trail hikes northeast, reaching the park’s visitor center and museum and completing the adventure. This National Park Service monument park offers free parking and admission.